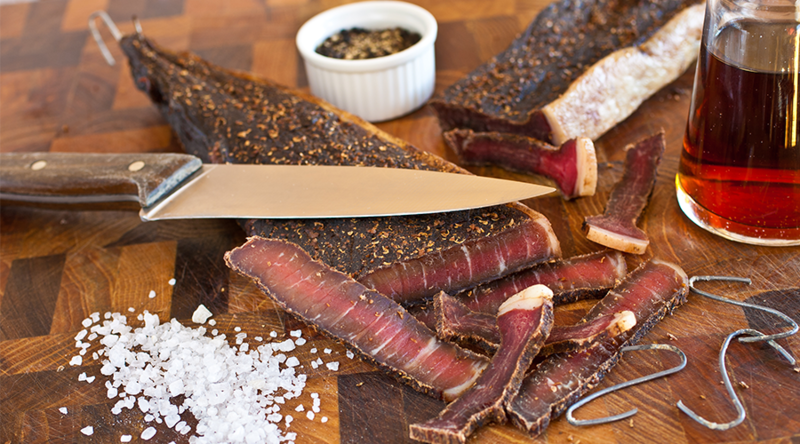 Biltong is a firm South African family favourite consisting of dried, cured meat. It is preserved using sodium nitrite or potassium nitrate – also known as saltpetre as well as other flavourants such as pepper, coriander and spices such as cloves. Biltong’s origins can be traced back to the Khoisan people, as well as the European settlers of the 17th century. Each had their own way of preserving meat pre-refrigeration technology. The preservation methods included slicing the meat, salting it and hanging it up to dry, as well as using vinegar as part of the curing process. The use of saltpetre, as well as vinegar in the curing of the meat, helps in eliminating certain strains of bacteria known to contaminate food and cause serious health implications if consumed. In addition to the salt and vinegar, coriander and coriander oil were also found to be effective in the prevention of bacteria growth in the preserved meats. Biltong is generally made of preserved cuts of beef such as the fillet or sirloin cuts, but can also be made out of most game meats (springbok, kudu etc. ), as well as ostrich, chicken and even some fish. However, a recent study conducted in the US has revealed that the nitrates that are crucial to the curing of preserved and processed meats i.e. biltong (or jerky as it’s known in the US) may play a role in contributing to mania in people with and without pre-diagnosed psychiatric conditions. Mania, according to Hopkins Medical centre is characterised by “hyperactivity, euphoria and insomnia”. The results of the study conducted by Johns Hopkins Medicine were published on the 18th of July this year in Molecular Psychiatry. It is acknowledged in the medical community that genetic factors and inheritance, as well as other risk factors, most certainly play a role in contributing to the onset and frequency of manic episodes that are often characteristically associated with bipolar disorder, however neither of them provide a succinct enough reason as to what causes the mental illnesses. Therefore, researchers, scientists and doctors are now looking at environmental factors too, which is where diet comes in. The researchers involved in the study say that “their new study adds to evidence that certain diets and potentially the amounts and types of bacteria in the gut may contribute to mania and other disorders that affect the brain” (2018), particularly nitrate-cured meats. It was observed during the study that “people hospitalized for an episode of mania had more than three times the odds of having ever eaten nitrate-cured meats than people without a history of a serious psychiatric disorder”. The theory was also tested on rats, which also showed mania-like symptoms when placed on a nitrate-filled diet for a sustained period of time. The study is on-going and inconclusive as of yet, though Khambadkone, one of the researchers involved in the study says that its evident that “mania is a complex neuropsychiatric state, and that both genetic vulnerabilities and environmental factors are likely involved in the emergence and severity of bipolar disorder and associated manic episodes, our results suggest that nitrated cured meat could be one environmental player in mediating mania.” However, the good news is that it seems that there’s no need to give up eating biltong and droëwors just yet, just maybe not every day – until we know for sure that is.